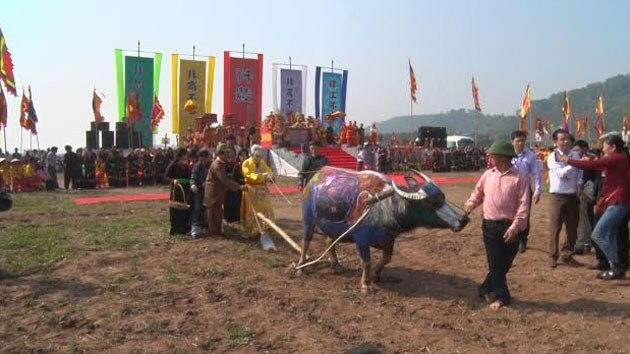 Hanoi (VNA) – The annual Tich Dien (ploughing) festival to pray for a year of favourable weather and bumper crops took place in Doi Son commune, Duy Tien district, the Red River Delta province of Ha Nam, on February 14 or the seventh day of the first lunar month. Vice President Nguyen Thi Doan joined crowds of guests, local officials and residents at the festival. Legend has it that in 987, King Le Dai Hanh came to the foot of the Doi Mountain to hold the first ploughing ceremony. The festival then became a tradition and was held through many dynasties before falling into oblivion. The tradition was restored in 2007. The same day, the Hanoi Department of Agriculture and Rural Development held a Xuong Dong (going to the field) festival and launched the annual tree-planting spring campaign in the city’s farming district of Phu Xuyen. Addressing the event, Deputy Prime Minister and Secretary of the municipal Party Committee Hoang Trung Hai highlighted the significance of tree-planting to the landscape and environmental protection.